To describe this book in one word is impossible. 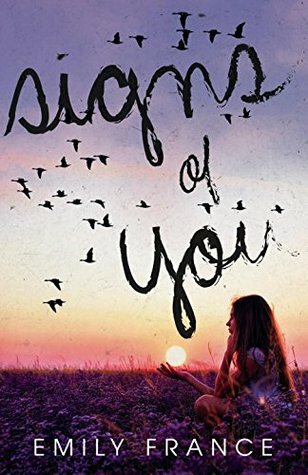 Signs of You, covers a variety of different book genres - contemporary, mystery and magical realism all twirled into one FANTASTIC story. If you're someone who also enjoys history, this one might be for you. Emily France, takes a non-ficiton story and turns it into an eye catching YA novel that had me hooked from the first line. The premise of this story is unlike any YA book out there. I found myself completely engaged with the story and lives of every character. You felt the hurt and anger between the different griefs everyone was dealing with. I loved seeing how strong the friendships were. And how they were able to find each other through a difficult time in their lives. The middle of the story was probably my favorite. Ever time I told myself, "okay, this is the last chapter before bed." Something interesting happened and I couldn't look away. The mystery aspect of this book had been just enough to have the hairs on the back of my neck stand up! Wondering if there's any sort of romance? Why yes! By all means, this isn't a romance book, but the growing connected between the two characters was so well done. I believe if this book started with full blown romance, it would have taken away from the true meaning of this story. Everything truly fell into place, and was so organic Signs of You, is a story that won't be forgotten. I am deeply moved by it in many ways. It shows the beauty of one's strength to move forward in life after a loss. That it is okay to hurt and be angry, but to know that we can move on in peace is even more uplifting. Emily France, debut novel is not one to miss!